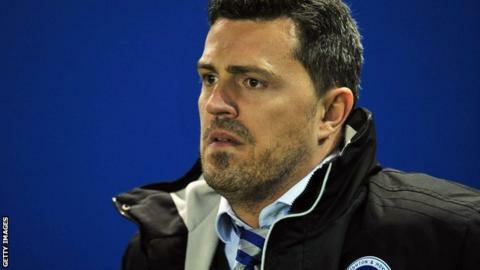 Brighton & Hove Albion head coach Oscar Garcia insists "it has been a very good season" despite in the Championship play-offs. The Seagulls only secured a sixth-place finish when in the final game of the league season. That set up a semi-final tie with Derby which they lost 6-2 on aggregate after a 4-1 second-leg away defeat on Sunday. "I couldn't be prouder of my players - Derby were just better," said Garcia. "There was not much we could do about that. We are disappointed, but if you see the whole picture, it has been a very good season." His exit prompted the who recovered from a slow start at the club to clinch a top-six finish courtesy of an eight-match unbeaten run. When asked about planning for next season at the Amex Stadium, the Spaniard appeared coy on his future. "The squad gave me everything and it has been a real pleasure to be their manager," 41 year-old Garcia told BBC Sussex. "We have dealt with a lot of injury problems this season, and I have to tell the players I am very proud of them, then we will see what happens."